Eleven miles from Galway City, at the entrance to Connemara, stands the Galway Manor Estate. Situated on the shores of Ross Lake, this 120 acre estate offers accommodations in a glorious setting of mountains, lake, parkland and forest. 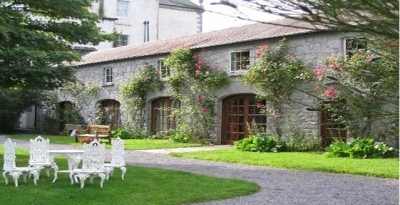 Set adjacent to the Main House lays the grand courtyard surrounded by self catering units, two cottages, four interconnecting apartments, and a chapel. During your stay at the estate's Main House, all of the following services will be provided and included: breakfast, dinner with wine, personal laundry and cleaning. The elegant drawing room with two Steinway grand pianos, Persian carpets, fine oil paintings and an antique chess table has three windows that command a stunning view of nearby mountains and lake. The dining room seats twelve at the main table and six at an additional table overlooking the park and lake. The room boasts a great stone fireplace with a carved coat of arms commemorating the marriage of Robert Martin, who built the castle in 1590, and Kate Lynch. The Martin and Lynch families are two of the fourteen "tribes of Galway". The Library, which has over a thousand volumes as well as current magazines and newspapers, has a log fireplace that warms the celebration of afternoon tea. The grounds of the estate are ideal for young people, offering tennis, boating, football or softball on the sixteen acre front lawn, fishing and a jog through the forest. There is swimming in the heated indoor pool, table tennis in the St. George and pool in the Billiards Room. Set adjacent to the Main House lays the grand courtyard surrounded by self catering units, two cottages, four interconnecting apartments, and a chapel. For family reunions, anniversaries, or a large group of friends vacationing together, the Galway Manor Courtyard is an ideal location sleeping a total of 36 additional guests. All apartments and cottages have complete kitchens (refrigerator, dishwasher, appliances/utensils). Rates stated include all utilities (heat/water) and the shower pressure in all apartments and cottages meets or exceed U.S Standards.